Words are funny things, they can change meaning in strange ways over the centuries. ‘Tory’ is originally an Irish word and one that is closely associated with South Armagh. It comes from ‘tóraigh’, to pursue – a person who is ‘tóraighthe’ was, we might say, on the run. It was first used to describe the groups who kept up a rearguard fight at the end of the Cromwellian wars and in the following decades to those same gentlemen when they took to hold-up work on the highways. They were always recognised as very political highwaymen and there were an awful lot of them, particularly in South Armagh. After the Williamite settlement in 1689-91, our local tories were strong supporters of the Stuart cause. In the 18th century the political faction in London which still hankered after return of the Stuart kings and which evolved into the Conservative Party, were accused by their political enemies, known as the Whigs (later Liberals) of consorting with Irish tories and Scotch cattle raiders. Eventually the Whigs just called them Tories as a term of abuse. These roving bands of displaced, landless swordsmen were known by different names at different times. 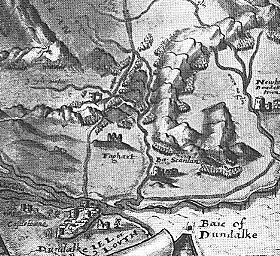 After the defeat in Kinsale in 1601 and the Plantation of Ulster in 1609 they were called woodkerne – the kern was the Irish infantry footsoldier and all the Kearneys owe their name to him. Then from 1640 to about 1700 they were tories, and in the Penal Days they were generally called rapparees from the short pike or rapaire that they carried, although the term tory tended to stick in South Armagh long after it had been replaced by rapparee elsewhere. In the late 1990s a journalist called Toby Harnden wrote a book called ‘Bandit Country’. He took his title from a speech by Labour Secretary of State for Northern Ireland Merlyn Rees, who so referred to South Armagh in the mid-1970s. But that wasn’t the first mention, not by a long shot. Dean Jonathan Swift made very similar comments in the 1740s. He was a constant visitor to Gosford Castle outside Markethill, which is where he wrote ‘Gulliver’s Travels’ and he wrote of his fear of the tories he might meet as he made his way from Dundalk through Silverbridge and Dorsey and on by Ballymoyer to Markethill. And that was with the protection of the most feared tory-hunter of them all, John Johnston – Johnston of the Fews – who claimed to have beheaded over a hundred bandits. Well, he didn’t do his own beheading, he left that job to a turncoat called Owen Keenan from Tullyvallen. In Dorsey, not far from the big house that Johnston called Roxborough after the village his people came from in Scotland, there is a bog called the Tory Hole. Maybe we should dredge it for skulls. But the prize for first mention has to go to our very own St Oliver Plunkett who referred to ‘a country much infested with banditti’. It recurs a number of times in both Italian and Latin in letters he wrote to the Vatican in the 1670s explaining why he didn’t actually live in Armagh even though he was the Archbishop (and took a long time to visit it), but in Termonfeckin. So we shouldn’t get too uptight about references to bandit country, because the fact is that we have always had more than our fair share of bandits. The very first stagecoach that ever ran from Belfast to Dublin got held up at Flurrybridge. The best remembered tory must be Redmond O’Hanlon: more at the two links below. I know I’m probably going to get into trouble on this one because people can be sensitive, but we have a rich lore and tradition in the family nicknames which must not be lost. As a partial self-protection measure most of the nicknames will not be linked to actual family names except where I am reasonably sure they are all dead or gone or at least not given to taking offence easily. This group is the largest by far when an extended family is known by the name of a common ancestor or best-known relative. An example immediately to hand is the Corney Murphys (I feel safe making this exception) descended from or related to the illustrious Cornelius. Patronymics are most needed when there are many families with the same surname. When I was a lad I didn’t actually know that Paddy Nicholas, Owney Thomas and Dinny Oiny were all Murphys. There was a family at the end of the Adavoyle Road called the Paramore Murphys which sounded quite exotic since paramour is a French word for a high-class courtesan. The true explanation is more prosaic – they were descended from Padraig Mor or Big Paddy. The Hacklers combed the retted flax fibres with hackles, blocks of wood with six-inch nails driven through. Mickey Fidge Rice from Dromintee was a fiddle-player (fidleor) descended from fiddlers. Paddy the Racker O’Hare, a most peaceful man, was descended from traditional storytellers and reciters (rachtairi). Benny the Go was a blacksmith (gabh) or descended from blacksmiths. The Connas (my mother tells me) were butchers or sellers of meat (original word in Irish needed please) The process of nickname formation continued into modern times. My favourite of all is the man from Ayallogue who worked for a certain insurance company. He was known as Paddy the Pearl. Who were known as the Plucks, and why? The answer can be found on page 400 of ‘A Hidden Ulster’ the wonderful book by Padraigin Ni Uallachain of Mullaghbawn. Here we move into sometimes sensitive territory, but most are straightforward. Duff is black-haired, John the Boy’s people were probably fair-haired (bui), the Bugs were small (beag) and the Bucks were poor (bocht) – and they must have been really poor to get a nickname like that when nobody had tuppence. Paddy Easter (pronounced ayster) got his nickname from some ancestor who lived to be aosta (old). Some we can only guess at. We don’t actually know how the original Big Mickey (McNally) on the Adavoyle Road got his name. Did the Jinnits (jennit) share the characteristics of the mule? Were the Cracks in Meigh good company? Why is there a family in Ballynamadda known as Dutch? Who was Biddy the Blow and what did she do for a living? Which Edenappa family has Italianate good looks? What about the Whangs, did they make leather bootlaces? More rare and much more dangerous are nicknames based on odd or outrageous behaviour. There was a man in Forkhill who was known as ‘Dammit-O’ because he said that a lot. There was Paddy Go Easy who always tried to calm people down, and Butcher who intervened in every discussion saying “But, sure….”. I just want to say to all the descendants of Jemmy the Pisser that their secret is safe with me. Help is needed to get a good list of examples of nicknames and find explanations for them but in the interests of good community relations please don’t post them to the comments box below. Send them to me in confidence at ssmurphy@eircom.net so that I can subject them to stress testing first. Everything begins with townlands, the core geogpraphical unit for tracing everything historical because they predate English rule but were continued through the ‘shiring’, the establishment of the counties, and the Plantation of Ulster. If you know what townland your people were in a hundred years ago you can start with the 1911 census. But as you move backwards watch out for changing spellings – Adavoyle, for example, is a particular nightmare. You also need to know that we are in the Barony of Orior (sometimes spelt Orier) and the civil parish or DED (District Electoral Division) of Jonesborough. The house numbers used by the census enumerators are meaningless and just reflect the order in which they visited houses – the numbers in 1901 are totally different. So if, for example, there are people of the same name all over the place in a townland you have to figure out a couple of families you can identify and then mentally go up and down the different roads. Or else check out everyone of the name until you recognise some forenames which are generally handed down. Repeat the process for 1901. Look at the original forms as well as the summaries where you can check whether your people were still Irish speakers. There are supplementary forms where, using the house numbers, you can check whether the house was thatched or slated, number of outbuildings and so on. Note also the number of ‘servants’ of very young age. We couldn’t find my granny in Adavoyle but we tracked her to Carrickbroad where she was ‘hired’ at 10 years of age. This is an extremely interesting resource which used to be difficult to access but is now available free online. Over a 20-year period every landholding in Ireland was measured and valued with lists showing landlord, tenant, acreage, valuation and so on. Most of this area was done in 1864. Choose Placename Search and enter the name of your townland (you may have to try different spellings – Adavoyle = Aghadavoyle and I remember problems with Edenappa), then select Armagh from the county list – ignore the Barony box. When the new page comes up click on Occupants and then choose Original Form which is a facsimile of the original book page. Find your family and note the holding number in the left column. Close the list, click back to the Townland page and click on Map View using the larger icon with a cross in it on the right. The numbers in the map plots correspond to the numbers on the list pages. Each name represents a farm or household. This was shortly before the Famine – just look at the sheer numbers on the land. Tithes were related to farm size and output and were naturally hated by Catholics although I doubt if Protestants were wild about them either. They were collected by a ‘proctor’, a sort of contractor on a percentage. At about this time the Rector of Jonesborough’s proctor was murdered in Faughiletra. A dozen or so men covered in white bedsheets battered him with spades – everyone had to give a wallop so everyone was equally guilty and equally interested in keeping his mouth shut. In 1659 a survey was made of residents (as opposed to households) per townland. The information available is partial but it shows that there were 10 people in Dromintee townland, 13 in Faughilotra, 16 in Carrickasticken, 18 in Carrickbroad and precisely 2 in Cloghinny.